For use with electric or air drills. Both units are made of stainless steel and will enter container through a 1-7/8" opening. Used for rapid and thorough mixing of paint, epoxy compounds, waterproofing materials, mortar, drywall mud and plaster. Unique four-way counteraction of blades give fast and complete dispersion with no splash. 6" diameter blade with 1/2" x 24" shaft for 5 gal. drum. 8" diameter blade for 30 to 50 gal. drum. Blades are made with 1/8" thick rugged fins. Extension shaft assembly available for use with either to mix in 30 to 50 gal. drum. These mixers are designed to handle the tough mixing jobs in a relatively short time. Upper paddle mixes downward and a lower paddle mixes upward. Made of high stress plated carbon steel. MX-SS132 32"L x 1/2" Dia. P.O.R. MX-SS136 36"L x 1/2" Dia. P.O.R. MX-SS612 12"L x 5/8" Dia. P.O.R. MX-SS615 15"L x 5/8" Dia. P.O.R. MX-SS618 18"L x 5/8" Dia. P.O.R. MX-SS620 20"L x 5/8" Dia. P.O.R. MX-SS624 24"L x 5/8" Dia. P.O.R. MX-SS626 26"L x 5/8" Dia. P.O.R. MX-SS630 30"L x 5/8" Dia. P.O.R. MX-SS632 32"L x 5/8" Dia. P.O.R. MX-SS636 36"L x 5/8" Dia. P.O.R. MX-SS640 40"L x 5/8" Dia. P.O.R. Stainless Steel Couplers for use in attaching mixing shafts. Complete with set screws. This container holder will safely and securely hold anything from pint cans to 5 gallon pails. It is fully adjustable for drill press columns from 2 3/4" to 4" in diameter. Adapts high speed disperser blades to 1/2" capacity drill presses. 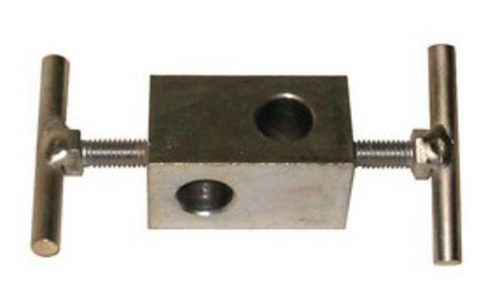 Features stainless steel shaft, drilled and tapped at bottom for 1/2" diameter stainless steel bolt. Blade not included. 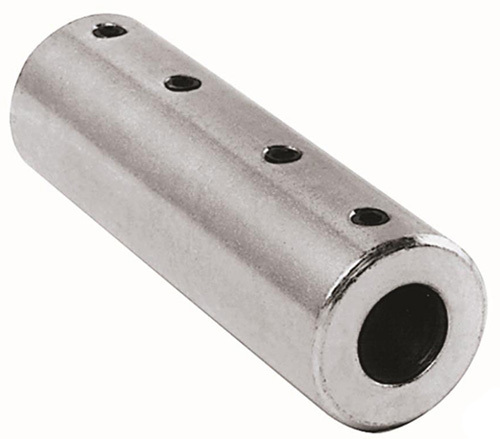 3/4" Diameter, 12" long; Chuck end 1/2" diameter x 1-1/8"
Adaptors designed to permit the use of standard laboratory High Speed Disperser Blades on small diameter shafts is available in heavy duty stainless steel. A set consists of two pieces and each set will reduce the 1/2" bore diameter of disperser blades to 1/4" diameter. 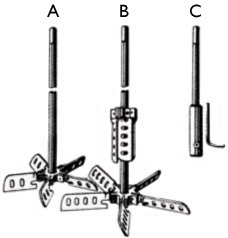 The set can be used with the smaller disperser blades in this section and with the small diameter shafts shown below. This arrangement is ideally suited to preparing emulsions, dispersions, paints, adhesives, etc., on lightweight laboratory equipment. Blade not included. Shafts are stainless steel, 5/16" and 3/8" diameter . One end is turned down to 1/4" diameter and threaded. Each shaft is supplied with a stainless steel hex nut. They are designed for use with electric drills, air powered stirrers, electric stirrers and any other equipment with a chuck capacity of 5/16" or 3/8". When used with the special stainless steel adaptors listed above they will take any high speed disperser blade with 1/2" bore. Ideal for preparing emulsions, dispersion, suspensions and small batches of adhesives, paints and lacquers. Will adapt any high speed disperser blade to a shaft. Made of cadmium plated carbon steel. Blade not included. Holds anything with a dia of 3" to 6-1/2". Chain locks securely in place. 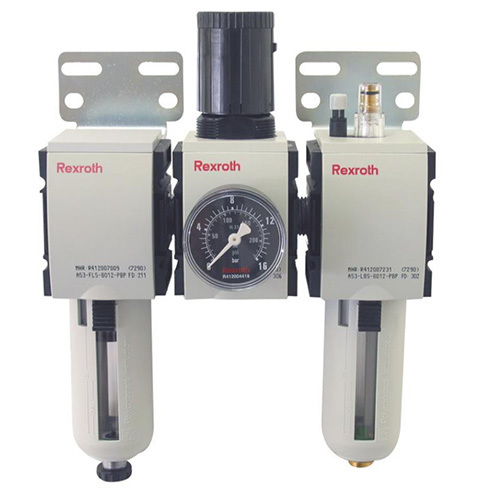 For use with electric drills, large beakers, bottles, distillation columns, etc. 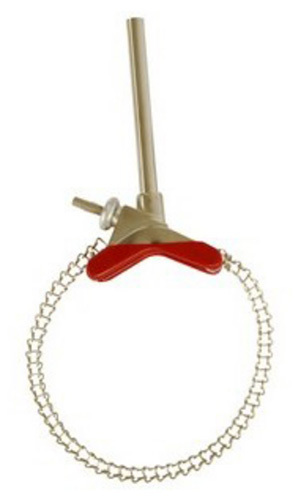 Used for attaching clamps, electric stirrers, air powered stirrers, extension rings, etc. to support stands. Also used for rods up to 3/4" diameter. Used for attaching clamps, stirrers, rings, etc. to support stands. Made from zinc-plated steel, it is by far our strongest clamp. Each adjustable drill-style chuck is fitted with a coupler that permits mounting on any motor shaft with a set screw. Complete with chuck key. New keyless chucks require only a twist of the wrist to change mixing shafts; no key needed, Convenient and handy if you change mixing shafts often. Space saving“piggyback” units combine all filter, lubricator and regulator features in compact unit that still yields optimal performance. Pressurized air flows through louvered deflector in a swirling pattern, with liquids and dirt falling into lower baffle where they are prevented from re-entering the air stream. Clean air passes through element and open poppet valves to outlet port. Element removes impurities down to 40 microns. 150 PSI maximum pressure range (except MX-PB362S, is 125 PSI) is adjustable through spring action of T-handle. Operating temperature range is -10° to +175°F. Manual drain. Shatterproof polycarbonate bowl. 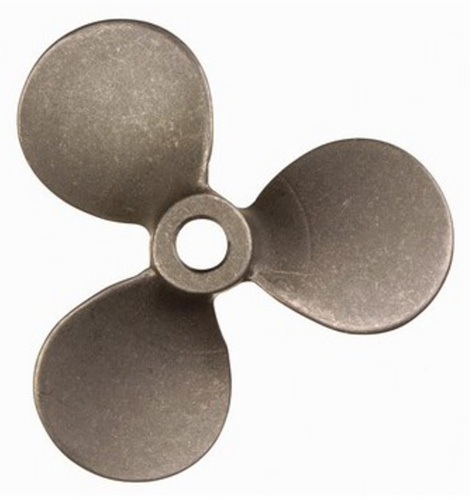 Stainless Steel three-bladed propellers. Each is supplied with a set screw for easy mounting. Several may be mounted on a single shaft when necessary for mixing heavy viscous materials. Other sizes available. Each is supplied with a set screw for easy mounting. Several may be mounted on a single shaft when necessary for mixing heavy viscous materials. 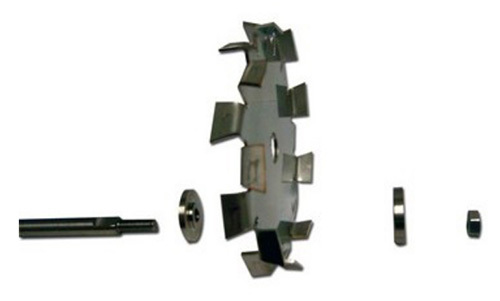 Three-bladed, axial flow, turbine impeller with 45° pitch welded-on blades. Manufactured of stainless steel and stressproof carbon steel. Other bore sizes available. Stainless steel special unique folding design folds for entry–opens when operating. 5/8" bore and mounted to shaft with set screws. Each is supplied with a set screw for easy mounting. 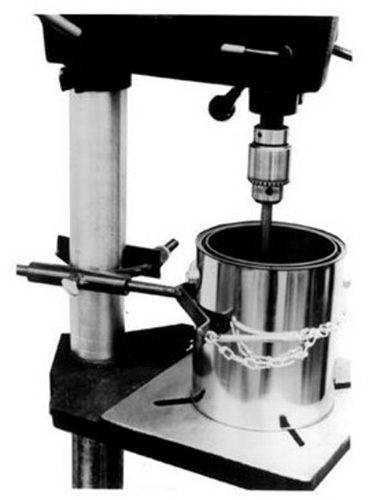 Several may be mounted on a single shaft when necessary for mixing heavy viscous materials. Other diameters available. Other size shafts available. See mixer shaft section. MX-STI12 Stainless - 12" diameter, Blades are 2" wide x 1/4" thick Bore size 5/8, 3/4, 7/8, 1" P.O.R. MX-STI15 Stainless - 15" diameter, Blades are 3" wide x 1/4" thick Bore size 3/4, 7/8, 1, 1-1/4, 1-1/2, 2" P.O.R. MX-STI18 Stainless - 18" diameter, Blades are 2" wide x 1/4" thick Bore size 5/8, 3/4, 7/8, 1" P.O.R. MX-STI24 Stainless - 24" diameter, Blades are 5" wide x 1/4" thick Bore size 3/4, 7/8, 1, 1-1/4, 1-1/2, 2" P.O.R.